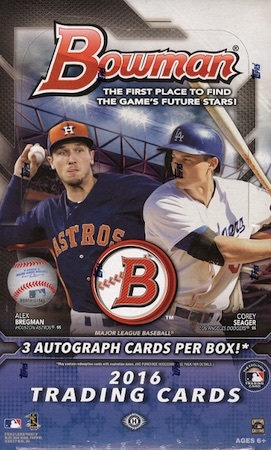 Although it adds a few new elements, 2016 Bowman Baseball will be a familiar sight to prospect collectors. 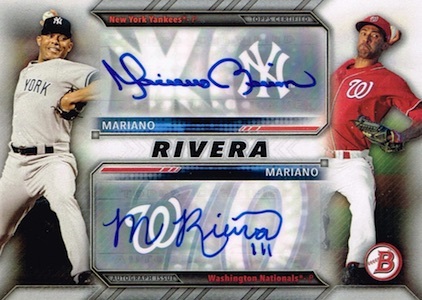 Following the recent pattern, each hobby box includes one autograph and jumbo boxes offer three autographs.. Featuring key rookies like Miguel Sano and Kyle Schwarber, the base set showcases the top current players in the league. 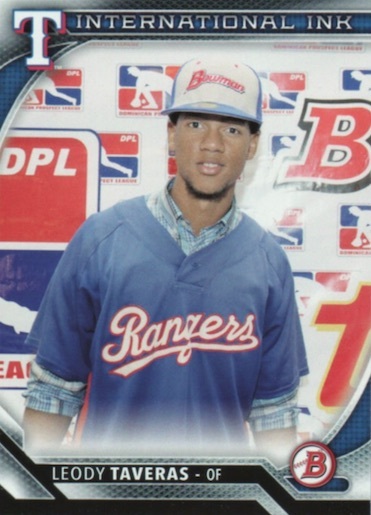 Adding to the that, 150 Paper Prospects focus on the potential stars of the minor leagues. Paper parallels include Silver, Purple (#'d), Blue (#'d), Gold (#'d), Orange (#/25 - Hobby), Red (#/5), Metallic (1/1) and Printing Plates (1/1 - Hobby/Jumbo). Retail exclusives include Green (#'d) and Yellow (Value Packs). The checklist of prospects is further covered with a variety of Chrome parallels. This includes Refractor, Purple Refractor (#'d), Blue Refractor (#'d), Gold Refractor (#'d), Orange Refractor (#/25 - Hobby), Red Refractor (#/5), SuperFractor (1/1 - Hobby), and Printing Plates (1/1). New options in 2016 Bowman Baseball come in the form of Green, Orange and Red Shimmer Variation Refractors. There are also retail-exclusive Green Refractor (#'d) parallels. 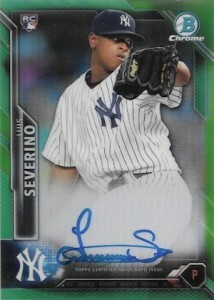 The key point for most collectors, Chrome Prospect Autographs features on-card signatures for young baseball talent. Hobby-exclusive parallels include Refractor, Purple Refractor (#'d), Blue Refractor (#'d), Gold Refractor (#'d), Orange Refractor (#/25 ), Red Refractor (#/5), SuperFractor (1/1), and Printing Plates (1/1). There are also signed versions of the Shimmer Variation Refractors and base Green Refractor (#'d - Retail) parallels. 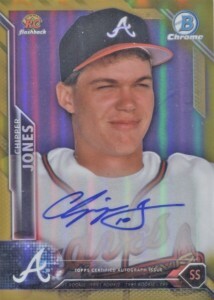 New MLB players get in on the fun with Chrome Rookie Autographs. Again, a mix of signed, hobby-exclusive parallels provide more rarity, with Refractor, Blue Refractor (#'d), Gold Refractor (#'d), Orange Refractor (#/25 ), Red Refractor (#/5), SuperFractor (1/1), and Printing Plates (1/1). 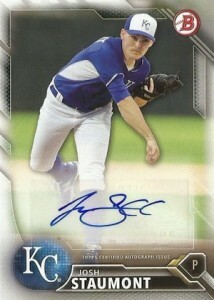 Rounding out the signed content, Turn Two Autographs features dual-signed cards for various prospects. 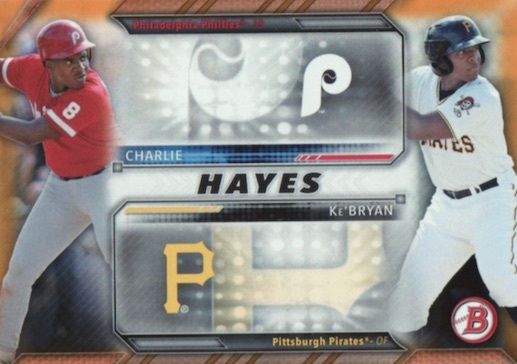 Gold (#'d) and SuperFractor (1/1) offers more to chase as well as hobby-exclusive insert versions. All-America Game Autographs features an early look at top prospects and the Ultimate Autograph Book packs 24 prospects signature onto one card. 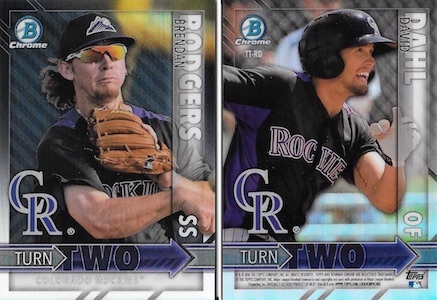 2016 Bowman Baseball also boasts multiple insert options. 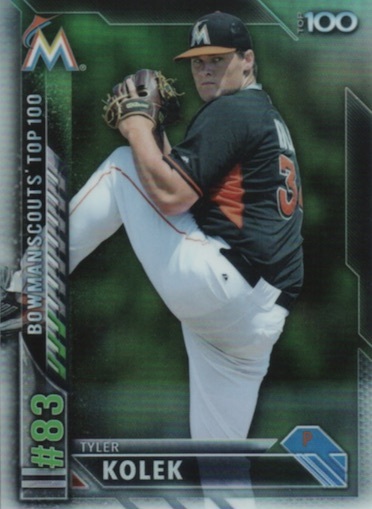 Bowman Scouts' Top 100 counts down the top prospects and Rookie Recollections celebrates the 25th anniversary of 1991 Bowman. 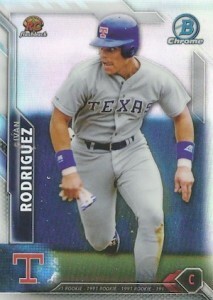 1991 was home to rookie cards for Chipper Jones, Jeff Bagwell, Luis Gonzalez and Ivan Rodriguez. Both insert sets include (Green #'d - Retail) Gold (#'d), Orange (#/25 -Hobby), SuperFractor (1/1 - Hobby) and limited Autographed parallels. 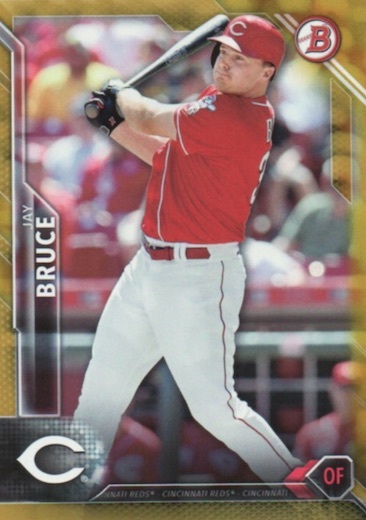 Rookie Recollections also has Red (#/5) parallels. Among other choices, International Ink honors the top global prospects to be signed during the July 2015 period. Also, Family Tree celebrates father-son combinations and Sophomore Standouts looks back on the stacked 2015 rookie class, including Carlos Correa and Kris Bryant. Each of these inserts includes Blue (#'d), Orange (#/25 - Hobby), Red (#/5), and Metallic (1/1) parallels. Also, autographs can be found for each, including Red (#/5) and SuperFractor (1/1) parallels for Sophomore Standouts. Collectors can also find exclusive posters and 5x7 prints for the set through the Topps Online Store. 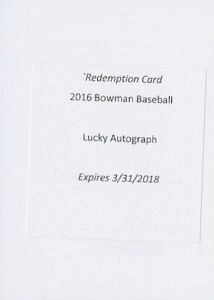 UPDATE: A late addition to the 2016 Bowman Baseball checklist, the unannounced Lucky Autograph redemption was revealed to be for rookie phenom Trevor Story. 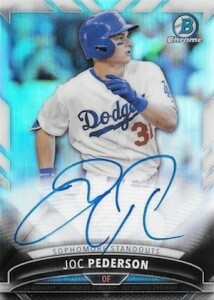 Collectors holding the limited redemption can exchange it for a Chrome Rookie Autograph for Story. 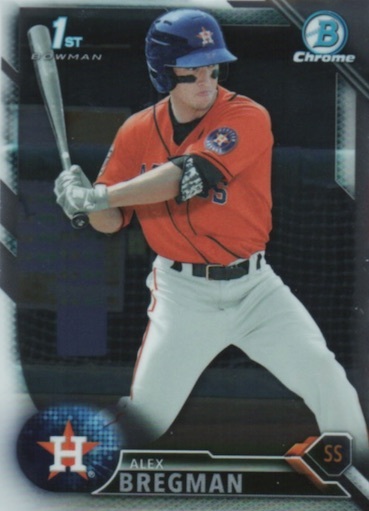 UPDATE 2: Similar to previous years, Topps revealed that a special Light Blue Chrome parallel for the Prospect cards will be made available through Topps MVP stores and the Bowman social media channels. 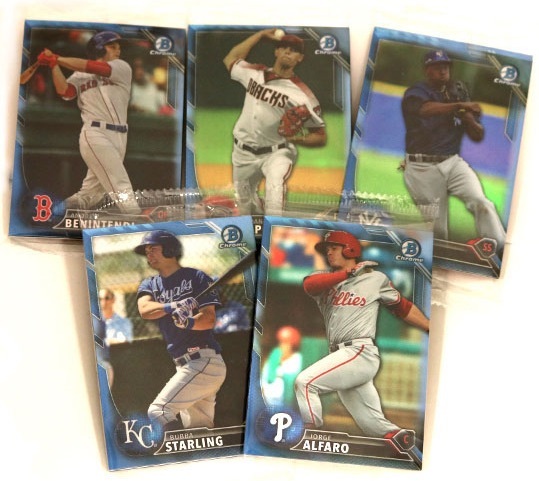 The five-card packs include exclusive Refractors that are numbered to 15 for the full 150-card Prospect set. A total of five packs will be given away online while the rest will made available at MVP stores. Autographed versions, numbered to 3 copies, average approximately 1:3 packs. No details were provided regarding how the packs will be issued at MVP hobby shops. 150 card. Shop for base sets on eBay. PARALLEL CARDS: Green #/99 (Retail), Blue #/150, Orange #/25 (Hobby), Red #/5, Metallic 1/1. 4 cards. Serial numbered #/25. Hobby and Jumbo only. 5 cards. Serial numbered #/99 or less. Hobby and Jumbo only. 9 cards. Serial numbered #/200 or less. Hobby boxes have 24 packs of ten cards. Autographs are inserted one per box. Jumbo boxes have 12 packs of 32 cards. Autographs are inserted three per box. Good: Strong autograph checklist, hard-signed content, prospect paradise. 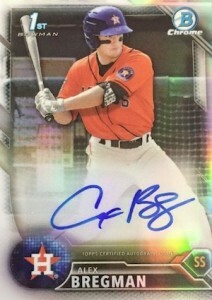 Bad: Inserts feel a little stale, not enough color per box, just one autograph. The Bottom Line: A wise man once said that Bowman is Bowman. 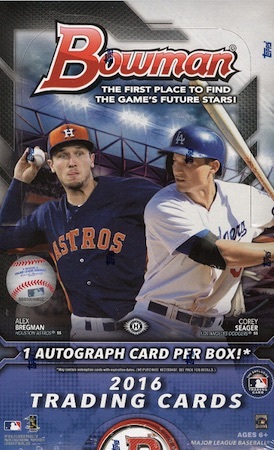 Collectors gravitate to the early-season release for one main reason and that is the prospects (and maybe the rookies to a lesser extent). 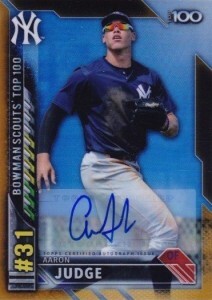 In this aspect, Bowman delivers with the customary on-card autographs and a deeper checklist of notable signers. 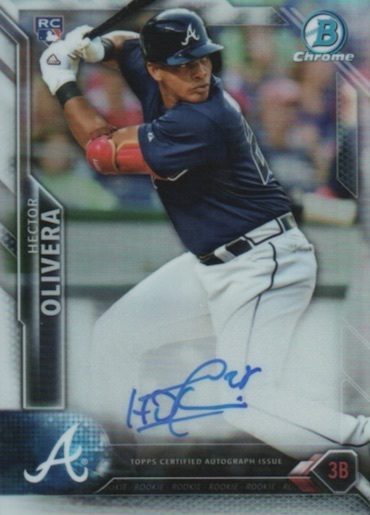 If the flagship design change with full-bleed images and smokey corners has you yearning for borders and a more familiar look, 2016 Bowman is a good option. While the design is a little more apparent compared to last year, perhaps too much in some spots, one noticeable change is the lack of foil on the base design. For many, it might not matter, but I like it. I do find the little cutout on the right side to be odd. My eye is drawn to it and I feel compelled to try and put a quarter through it. The main problem I have with the Bowman design is that it all starts to blend together. Many of the inserts are a little bland, especially the Sophomore Standouts. And while I have no issue with highlighting genetic connections in the MLB, the Family Tree design seems made for the sticker autographs and looks fairly incomplete without them. Bowman is largely about keeping the status quo and that is part of the problem I see with the design. Most of all with 2016 Bowman Baseball, I was looking for a little more Refractor color in a sea of white and chromium. I get that this is not Bowman Chrome, but it seems that color is very limited by the box and I only pulled one Refractor (Prospect Purple). Every year, the complaint from many is that “X team” was underrepresented. While that has been an issue for some this season, it appears that most were satisfied by the overall coverage for each team. Because prospects rise and fall on a regular basis, a great checklist initially can become a stinker down the road and vice versa. However, at the time of release, it appears that Topps did a fairly good job putting this checklist together. With just one autograph in a standard hobby box and limited color, value is not the strongest proposition for 2016 Bowman Baseball. There is just only so much you can do with a stack of paper base, chrome base, and generic inserts. While the price point is pretty low, you still have to bank on a good prospect or some rare Refractor to make it worthwhile and that is not easy by the box. Although they are few and far between, the elusive Superfractor always remains the home run option in these boxes that can push collectors to try their luck. By their very definition, prospects can be an exciting gamble. However, the payoff can be extremely slow. Hurry up and wait is not the most fun idea when it comes to cards but that is part of the process. I am definitely interested to see how the players turn out but the enjoyment is not quite the same when the overall product is not that memorable. Super excited for this release even though they spelt Bergmans name wrong! Bob C � Hi Bob, I don’t believe I have ever seen one pulled but I assume it is issued as a redemption. Looking forward to this release, there are a lot of good prospects from every team, who ever pulled that ultimate autograph booklet card will have a prized possession, if it is done by a card breaker, every person who has a player on that card with that particular player playing for that team,the card will probably be randomized, good luck to all. At least from the photo it does not appear that these (base) cards have foil on them which would be welcomed. I’m not a big Bowman fan, but I like the way these look. Bowman has really missed the boat for several years now when it comes to SF Giants rookies. Only two in this product (Fox/Coonrod). There’s no reason why I should buy any of this product. Mo P – If I’m counting correctly, there are 65 prospect autographs available between Hobby and Retail, which would be 2-3 from every team. Seems like the Giants fall right in line with that. Unfortunately for San Francisco prospect fans, the Giants really haven’t been cranking out top prospects of late like some of the other teams that have more representation. Not sure that is Topps’ fault. They really upped their game on retail paper autographs. Lots of big names in that checklist. Top 100 Swanson auto is listed as Dbacks on checklist but came out as Braves in current eBay sales. Lots of folks overpaid on Dbacks breaks. Bob C � Per Mike V on Twitter (https://twitter.com/mikev1975), who pulled an Ultimate Autograph Book from 2016 Bowman, they come in a regular pack. 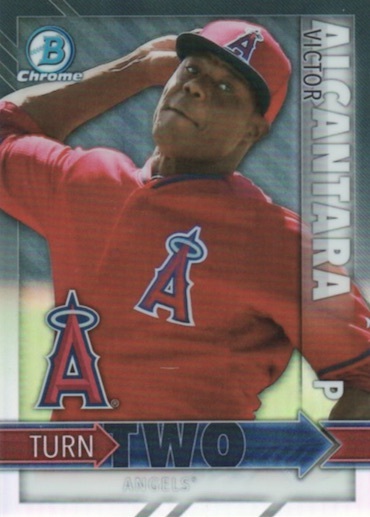 Anyone know if the paper stock for the Bowman cards (non chrome) are thinner than last year and most cards made nowadays, including topps series1 (which is probably the closest comparison in quality)? Or maybe its the retail cards vs. hobby? I bought a few blasters to check them out so i dont have a hobby to compare them to, but for some reason it feels REALLLY flimsy. Compared to Topps Series1, its pretty close, but I still think its a hair off. A hair off to someone who is messing with cards 4-5x per week is just a strange feeling. Anyone else or am i…well go ahead and ________. Heh…sorry. Me again. I actually think its the same as usual (maybe a hair off? ), but I guess its because all I’ve been messing with lately is Heritage and Gypsy Queen cards which are obviously much different/thicker. So its probably me. Sorry for wasting everyone who read this post’s time. hah. The card stock for Bowman seems to be just a tad more sturdier than Topps and Topps OD. The card stock appears different than 2015, thinner, more flexible. It is the same type of card stock used on 2015 Topps Football. 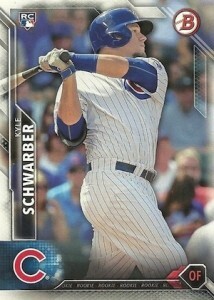 The great thing about Bowman is there is no foil on the card. The first time in at least 20 years. There’s no “they” lol, it’s THE Ultimate autograph book… as in, singular issue… 1/1. From kansas and pulled raul mondesi rc on my first deck. How many cards total possible? Dont really want to add them all up and cant seem to locate a total number right now? Thanks. Actually the Ultimate Autograph Book is #/10. Really like the design this year and as someone else stated no foil (I can actually read the name). 2 jumbos and haven’t pulled any huge names but some real nice color. Solid inserts. 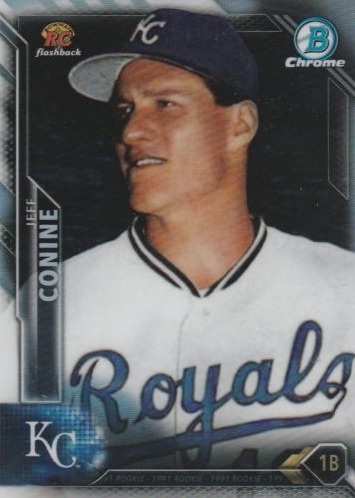 I would rather see the Rookie Recollections be a chrome reprint. Very nice product this year with some great prospects. Pretty easy set to put together. But we will see in a few years. I got a Moncada gold auto #/100. I understand that the gold itself is out of 100, but is there another set of 100 just for “auto gold”? or, out of the #/100 golds, only some are autographed? 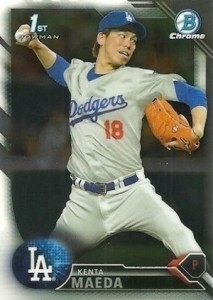 I’m pretty new to collecting baseball card itself, and new to Bowman as well, so don’t know how it works. Somebody please let me know. Oku � Congrats on the hit! Those Gold Refractor Autographs for Moncada have been selling for around $1,400+. The Gold Refractor Autograph is a parallel to main Chrome Prospect Autograph set. This means it adds to the total and there are only 50 of the Gold Refractor Autographs for Moncada. 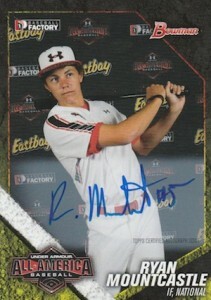 He also has signed versions for the other color parallels and a base version that is not numbered. 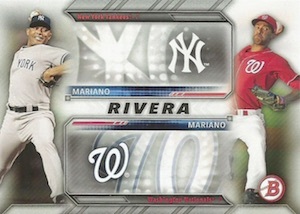 Plus, there is a non-signed version with all the parallels again. I searched ebay and knew that the blue refractor autos (#/150) of him were selling for around $700, so guessed the gold would go higher, but didn’t realize it was that high. 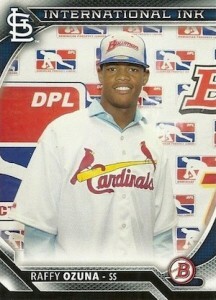 Crazy how the rookie/prospects cards could go high in the market. Understood that the gold refractors consist of 50 non-auto gold refractors, and 50 auto gold refractors. Good to know these infos!! Always a solid product. I like this years design a lot. Might be their best. Happy with my Blue /150 Aaron Nola autograph. 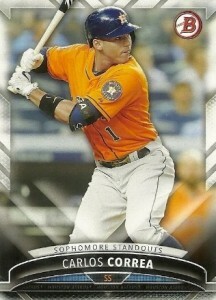 Any ideas what the Bregman is worth it’s ungraded but in mint+ condition? I got $200 for the Tyler O’Neil, think I could have got a bit more. 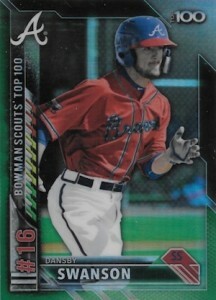 Is there actually a bowman green? 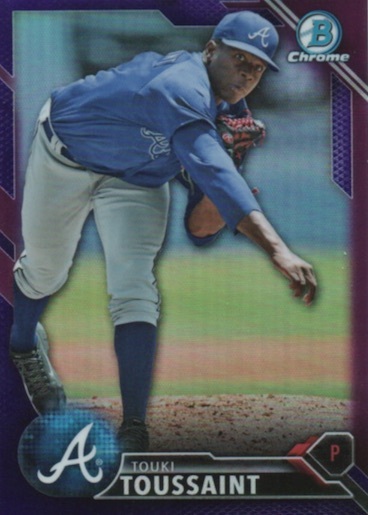 For MONTHS I have been trying to find the Michael Fulmer, but I haven’t seen one online, at shows, on eBay, ANYWHERE! Can someone confirm? The only things I have seen are green chrome refractors and green shimmer refractors. 2016 Bowman Chrome HOBBY MINI-Box (Vladimir Guerrero Jr Refractor AUTO 1 1)?